I thought I’d post some fun facts about me and my jewellery and book business! – Tiara wrote and illustrated her first book in primary school, her second in high school. – Tiara hand writes all of her fiction books/stories then types then up. Some non-fictions (Jewel Divas and Closet Confidential) are typed straight up. – After reading blog posts about bloggers turning their blogs into books, she thought, why not, I actually know what I’m doing. She wrote and released How To Be A Jewel Diva in 2014. It was turned into a paperback in 2017. 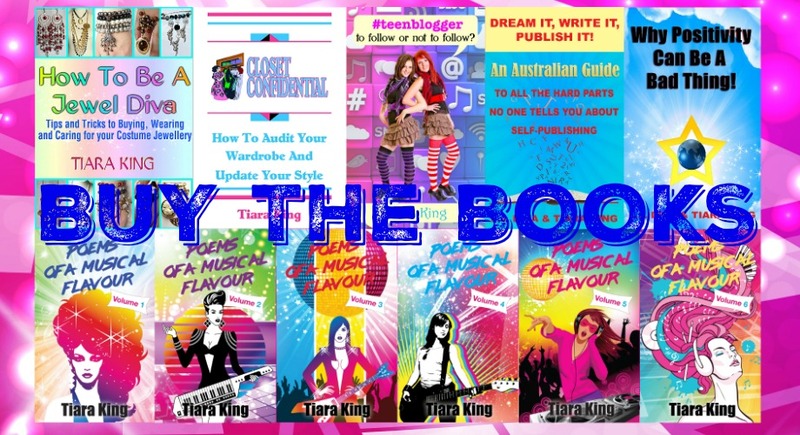 – In 2015 Tiara wrote Closet Confidential off the back of her styling course and it was turned into a paperback in 2017. – Tiara does most of her e-book covers herself, and mock up covers for the books that will be turned into paperbacks so the designer can see what she wants. – Tiara sometimes picks out a cover photo before a title or story idea comes to her. – #teenblogger came about with writing T.K. Wrathbone stories, but upon reading it, it was too light for T.K.W. so she released it under her own name. It’s just as relevant to adults as children. – The title for Poems Of A Musical Flavour came to Tiara out of the blue. Without music can song lyrics be considered poems? Hence the title. The 6 volume series are song lyrics Tiara wrote over the course of 1989 to 2002. She might get back to writing some one day. – Tiara loves disco balls, chandeliers, rainbows, palm trees and flamingos. Anything that glitters or reminds her of The Gold Coast in Queensland. – Tiara has extensive stationery collections with erasers, notebooks, notepads, stamps, pens, pencils and stickers. – She loves collecting unusual kaftans and kimonos on ebay. – Tiara gets all of her clothes on sale, most are under $25, as she knows how to budget and score a bargain. – Tiara is slack and lazy on social media and doesn’t promote herself enough. – Tiara did styling and colour courses through the Academy of Professional Image in 2013 and became a stylist. She decided upon wardrobe styling because she loves to organise and decorate. – Tiara makes all of her jewellery by hand. – Tiara currently has over 2000 pieces of jewellery in her own personal collection. – Tiara loves jewellery so much that Jewel Divas was created in 2008. 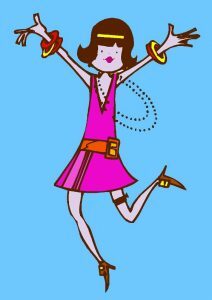 – The Jewel Divas Style blog started off as Jewel Divas Jewellery on Blogger in 2009. It was purely for talking about the business and promoting what was for sale. But it was updated and changed in 2012 when Tiara started talking about other things besides jewellery. She showed off her own collection and did posts showing how to make jewellery. The blog moved over to WordPress in 2013. – This was the original Jewel Divas jewellery logo, but now it’s just the company name…even though Tiara’s young at heart, the logo needed to grow up. It will be undergoing a makeover sometime in the future if the company continues. – At this point in time, Tiara’s not making or selling jewellery. With arthritis in her hands, and multiple books and pen names to deal with, she’s concentrating on her publishing company.